Astragalus root is one of the most efficient anti-aging herbal remedies. Astragalus (Astragalus membranaceus) root has a long-standing relationship in traditional Chinese medicine for treating energy deficiency and digestive disorders of the spleen and lungs. The herbal remedy is also known by its Chinese name huang qi, which translates as milk-vetch root. Astragalus root has been used for centuries, and it can help treat a variety of health problems, including blood disorders, human immunodeficiency virus (HIV), acquired immune deficiency syndrome (AIDS), cancer, diabetes, and respiratory infections such as asthma or bronchitis. Astragalus is a popular adaptogenic herb. This means it can improve your energy by helping the body adapt to stress and resist disease. The herb is also a great immune system stimulant, and it can help prevent and treat a sore throat and a common cold. It is also used for radiation and chemotherapy support, fatigue, chronic diarrhea, hepatitis, and heart function. Why is astragalus root an anti-aging herbal remedy? The anti-aging effect of astragalus root can be attributed to a particular chemical that activates the enzyme telomerase (hTERT). Think of your DNA like a shoelace, and your telomeres are the plastic caps at the end, which keep your shoelaces from unraveling. The telomeres help protect your DNA during the replication process. When you age, the telomeres shorten, which increases the lifespan of your DNA. The telomerase will protect the telomeres by increasing their length. Telomerase is often deactivated in adult cells; however, telomerase is active in sperm and egg cells, immune cells, and malignant cancer cells. The activation of telomerase can also stimulate additional telomere production. In traditional Chinese medicine, astragalus root will relieve spleen-deficient symptoms like appetite loss, fatigue, and diarrhea. It does this by increasing yang qi of the spleen and stomach. The root of astragalus will tonify the blood and protective qi called wei qi. It also contains other active constituents such as astragalosides, saponins, flavonoids, beta-sitosterol, selenium, and polysaccharides. The most notable polysaccharides in astragalus include astragaloside IV, calycosin, and formononetin, which help reduce inflammation and improve immunity. By nature, astragalus has a warming effect and it is sweet tasting. There is also evidence to back up the anti-aging effects of astragalus root. In a mouse study published in the journal Aging Cell, researchers from Spain showed that the activation of telomerase from astragalus root helped increase telomere length and decreased the amount of short telomeres overall. The study found that astragalus root improved various factors linked with aging, such as osteoporosis, skin health, and glucose tolerance. Most notably, the astragaloside IV, calycosin, and formononetin help activate pathways and other genes, which help with immune cell activity. Studies have shown that astragalus root can stimulate the immune system in several ways by improving T cell activity, enhancing the phagocytic activity of macrophages and monocytes, increasing natural killer cell activity, and increasing the potency of the herb’s other antiviral properties. Astragalus root is considered an effective treatment for acute and chronic bronchitis by strengthening weakened lungs and preventing upper respiratory infections that trigger asthma. The astragaloside, saponins, and flavonoids found in astragalus are thought to be involved to treat and prevent upper respiratory infections such as asthma, bronchitis, tracheitis, laryngitis, sore throats, and the common cold. Chronic hepatitis is liver inflammation that lasts a minimum of six months; it is commonly caused by hepatitis B or C viruses, as well as certain drugs. A study published in the Chinese Journal of Integrated Traditional and Western Medicine in 2000 found that a supplementation with astragalus root could effectively treat liver fibrosis of chronic hepatitis B patients. Another study published in the Chinese Journal of Hepatology in 2005 found that injecting an astragalus solution could inhibit experimental hepatic fibrogenesis possibly due to its antioxidant activity. Astragalus can help complement cancer treatment by reducing fatigue. In a double-blind, randomized, placebo-controlled study published in the journal Clinical Investigative Medicine in 2012, researchers found that Astragalus membranaceus root extract could safely treat cancer-related fatigue in patients with advanced cancer. The patients were treated with astragalus root extract for a two-month period. After the first month, about 82% of the cancer patients had increased energy. In those who hadn’t shown improvement in the first treatment, around 71% showed signs of energy improvement after the second treatment. Astragalus is also used in combination with other herbs like glossy privet for the treatment of lung cancer, cervical cancer, and breast cancer. It is also safely used in conjunction with other cancer treatments like radiation, chemotherapy, and surgery. Astragalus root is considered an effective remedy for diabetics since it exhibits improved blood sugar control. The polysaccharides in astragalus are thought to benefit those with diabetes. In particular, the active polysaccharide component of astragalus root extract is called astragalus polysaccharide (APS). In an eight-week rat study published in the journal Acta Pharmacologica Sinica, researchers found that APS extract reduced blood glucose levels and improved insulin sensitivity by activating the enzyme AMP-activated protein kinase (AMPK). Astragalus is also used to treat fibromyalgia, arthritis, kidney disease, chronic fatigue syndrome, anemia, seasonal allergies, diarrhea, ulcers, nervous conditions, wound healing, hemorrhaging, blood disorders, HIV/AIDS, heart disease, and high blood pressure. Is It Safe to Use Astragalus? When trying new herbal remedies, there is often concern whether they are safe to use. That being said, astragalus is considered relatively safe for most adults. On the other hand, dosages of more than 28 grams may interfere with immune activity, and those taking immune-suppressing drugs should avoid astragalus. People with autoimmune diseases are not advised to use astragalus root, including those with systemic lupus erythematosus (SLE), multiple sclerosis, and rheumatoid arthritis. Astragalus root should also be avoided in breastfeeding or pregnant women. A component in astragalus called astragaloside IV has been found to produce maternal toxicity and other fetal toxic events. Scientific evidence shows that toxic astragalus species have led to abnormal heart development and abortions during animal pregnancies. The herb is also thought to increase lactation. There are also some drug interactions associated with astragalus root. For example, since astragalus may lower blood sugar levels caution should be used while using the herb with blood sugar-lowering drugs. Astragalus should also be avoided with drugs that increase bleeding like blood thinners, aspirin, naproxen, anti-platelet drugs, and non-steroidal anti-inflammatory drugs (NSAIDs). Astragalus may also interact with blood pressure drugs, drugs with estrogen-like properties, and drugs for arthritis, obesity, osteoporosis, cancer, and anxiety. Other interactions with astragalus include lithium, cyclophosphamide, and diuretics. 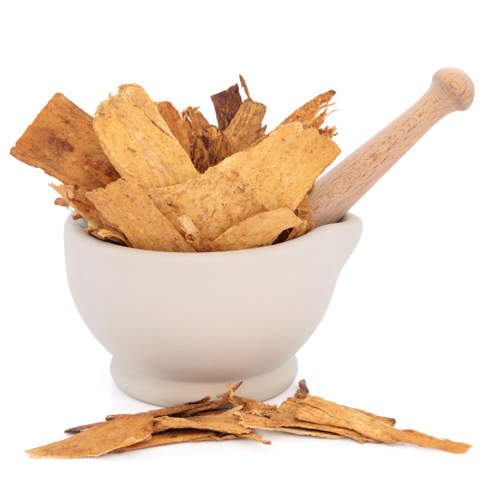 What Is the Best Astragalus Dosage? For standardized astragalus extract, take 250 milligrams to 500 milligrams, three to four times per day. In a tea, the recommended dosage requires you to boil three to six grams of dried astragalus root in 12 ounces of water, three times each day. Astragalus root tinctures often contain 30% ethanol. The best dosage is 20 to 60 drops, three times daily. Astragalus should not be used if you have a fever. Caution should be implemented as astragalus may increase the risk of bleeding in those with bleeding disorders. Caution should also be used in people with high blood pressure, neurological disorders, skin conditions, musculoskeletal disorders, and gastrointestinal conditions. Some holistic health practitioners avoid recommending the long-term use of a single adaptogenic herb. Astragalus should be taken in rotation with other adaptogens. It is also possible that the side effects associated with astragalus root are not well understood since it is often used in combination with other herbs. Where Do I Find Astragalus? How do you get astragalus health benefits? Well, astragalus root extract comes in several forms, including standardized and non-standardized tablets and capsules, dried astragalus root slices, astragalus root teas, astragalus root extract liquid tinctures, and topical astragalus skin creams. Astragalus root extract has also been injected in clinical or hospital scenarios in Asia. Astragalus root is found in Chinese grocery stores and health food stores. You can also find astragalus root in the offices of some herbalists and traditional Chinese medicine practitioners. Murray, M., M.D., et al, The Encyclopedia of Natural Medicine (New York: Atria Paperback, 2012), 180. Balch, J., et al., Prescription for Natural Cures: A Self-Care Guide for Treating Health Problems with Natural Remedies Including Diet, Nutrition, Supplements, and Other Holistic Methods (Hoboken: John Wiley & Sons, Inc., 2004), 60, 123, 128. Bernardes de Jesus, B., et al., “The telomerase activator TA-65 elongates short telomeres and increases health span of adult/old mice without increasing cancer incidence,” Aging Cell, 2011, 10(4): 604-621, doi: 10.1111/j.1474-9726.2011.00700.x. Chen, H.W., “A novel infusible botanically-derived drug, PG2, for cancer-related fatigue: a phase II double-blind, randomized placebo-controlled study,” Clinical and Investigative Medicine, 2012; 35(1): E1-11. Zou, F., et al., “Astragalus polysaccharides alleviates glucose toxicity and restores glucose homeostasis in diabetic states via activation of AMPK,” Acta Pharmacologica Sinica, 2009; 30(12): 1607-1615, doi: 10.1038/aps.2009.168. Rakel, D., et al., Integrative Medicine: Third Edition (Philadelphia: Elsevier Saunders, 2012), 150-151, 179. Zhou, X., et al., “[Study on the inhibitive effect of Astragalus injection solution on hepatic fibrosis in rats],” Chinese Journal of Hepatology, 2005; 13(8): 575-578. Chen, H., et al., “[Comparison on efficacy in treating liver fibrosis of chronic hepatitis B between Astragalus Polygonum anti-fibrosis decoction and jinshuibao capsule],” Chinese Journal of Integrated Traditional and Western Medicine, 2000; 20(4): 255-257. Meininger, K., “Dosage for Astragalus Root,” Livestrong.com, August 27, 2013; http://www.livestrong.com/article/445773-astragalus-root-herb-dosage/. “Astragalus (Astragalus membranaceus),” Clark’s Nutrition & Foods Market web site; http://www.clarksnutrition.com/ns/DisplayMonograph.asp?storeID=2691b1fe187d41acb869a85ca5957a0a&DocID=bottomline-astragalus#DOSING, last accessed January 4, 2016. “Astragalus,” National Center for Complementary and Integrative Health web site; https://nccih.nih.gov/health/astragalus, last accessed January 4, 2016. “Astragalus,” Weil web site; http://www.drweil.com/drw/u/REM00002/Astragalus-Dr-Weils-Herbal-Remedies.html, last accessed January 4, 2016. “Benefits of Astragalus Root,” Wellness Mama web site; http://wellnessmama.com/15726/astragalus-root-benefits/, last accessed January 4, 2016. “Astragalus,” WebMD web site; http://www.webmd.com/vitamins-supplements/ingredientmono-963-astragalus.aspx?activeingredientid=963&activeingredientname=astragalus, last accessed January 4, 2015.